Buy 4 magic mushroom grow kits (1200ML) in 1 package and get a sweet discount. 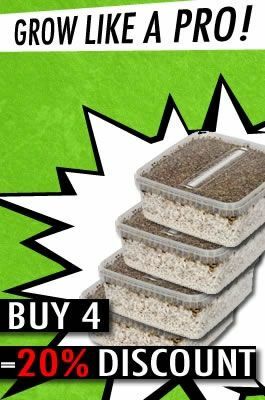 Growing magic mushrooms has never been easier and quicker with our new and improved mycelium boxes. You only have to add some tap water once to the magic mushroom grow box. After 12 hours you let the access water flow out of the grow set and place it in the provided plastic filter bag. Place the mushroom grow kits + filter bag in a bright spot (do not place in direct sunlight). After several weeks you will see your magic mushrooms grow to life!! With this magic mushroom grow kit you can harvest up to 5 flushes of your favorite magic mushrooms per mushroom kit. With an average of 500 grams per kit, you can harvest up to 2 kilograms of fresh mushrooms! The mycelium is colonized on a substrate of rye and perlite. The top layer is covered with vermiculite. The best place to store the magic mushroom grow kits is your refrigerator (not your freezer!) if you do not want to start growing immediately after receiving them. Do NOT store them any longer then 2 months. It is best to start right away. Have fun growing your own magic mushrooms! We do NOT ship this product to the following countries: Australia, Mauritius, Reunion Island, South Africa, Japan, Canada, Switzerland, New Zealand.